Despite its reputation as an insulating material, wool can be wonderfully weather resistant. Shoot, I have a pair of stout wool pants passed down to me from my grandfather that are remarkably warm and waterproof at more than 50 years old. But Dale of Norway has taken wool to a new, high-tech place with its Knitshell garments. They combine old-fashioned wool with nanotechnology and a wind-proof membrane. 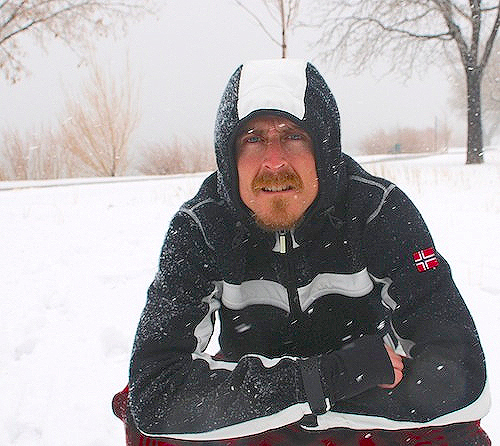 From the line, I put the made-in-Norway Telemark Knitshell jacket to the test. At $499, it’s a premium purchase, and it is an esoteric choice for outerwear. But in my use I found the wool jacket to be a functional and good-looking alternative to other shells. A dense wool weave makes the Telemark Knitshell a stand-in for a modern softshell. Both breathe and battle water, though they are not meant for prolonged wear in sleet or rain. The Knitshell is a dedicated winter coat. It is breathable and has the feel of a tightly-woven thick wool sweater. The jacket seems well suited to the sport which name it bears, Telemark skiing. It would work fine for a day on the slopes and would shine in moderate aerobic activities such as snowshoeing. My test was in windy and sloppy conditions during recent snowstorms in Colorado. Overall, I was impressed with its weather resistance. The jacket is lined with a windproof synthetic material. The sleeves are finished with a neoprene cuff. A removable hood is three-way adjustable. The jacket is warm but not overwhelming. Over just a thin base layer, it is good down to about 20 degrees F. With its durable construction I expect it would last for many years of winter use. Being early March in Colorado rain is pretty hard to find, so I did my best to test this in a range of weather, some real and some fake. 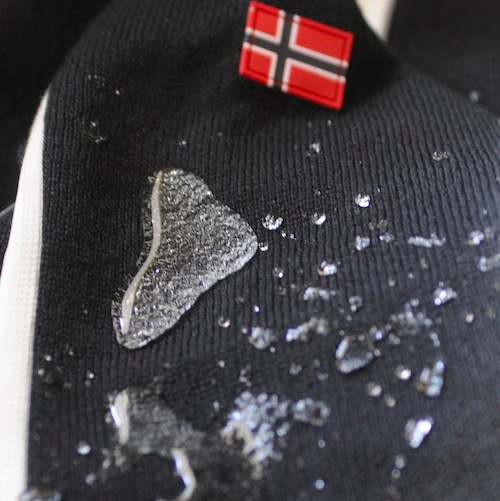 One time, I stood under a blasting showerhead for about five minutes and found that while the jacket did leak a little it remained mostly dry even under the simulated thunderstorm. The leaks did not come through the wool but instead through some small areas of trim material and at seams, which do not appear to be taped. The Telemark Jacket is clearly not designed to be a rain jacket, but in drizzly, cold weather, it would work for a day outing. In a full-blown rainstorm you’d obviously want a shell jacket with waterproof zippers and sealed seams. A note on sizing: The jacket is cut in European dimensions and runs about one size smaller than most jackets sold in the States. At 5’8” and 150 pounds, I fit a large just right. The jacket is made for winter conditions, and in snow, wind, and cold it shines. Put a couple layers underneath and the Telemark Knitshell is a stylish, weather-resistant piece ready for a range of temps and situations outside. It looks sharp and is suited to urban wear as well as mountains and forests, in Norway and far beyond. —Sean McCoy is a contributing editor based in Denver. previous:Get on a bike, roll free around the world. . .